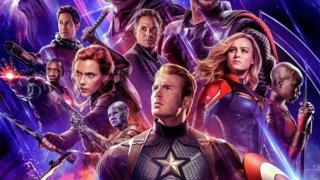 Marvel has changed its promotional poster for the much anticipated Avengers: Endgame film after complaints from fans. The original poster had pictures of all of the main characters on it, and these were accompanied by each actor's name. Black Panther actress, Danai Gurira, was the only character on the poster not to get a name credit. 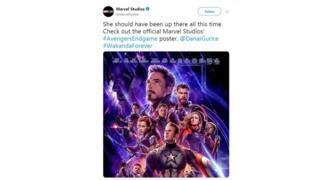 Fans made their feelings known on social media and Marvel quickly re-released the poster with Gurira's name added to it. How far would you go to see Avengers: Endgame? How much do you know about Marvel and DC superheroes? In the film, the Avengers team come together to try and rescue everyone after villain Thanos wiped out half of all living things across the universe in last year's Avengers: Infinity War. Gurira will resume her role as Okoye in the new film, which is released on 26 April.